At Actiflow, we use CFD on a daily basis to simulate gas and liquid flows. However, we feel that there is still quite some misunderstanding about this simulation method. Therefore, we provide you some explanatory information about CFD and how we use it. CFD is short for “Computational Fluid Dynamics”. It is a method to visualize and quantify gas and liquid flows and to assess their influence on their surroundings. CFD is a useful instrument in the early phases of a product or real estate development. With CFD you can assess the fluid dynamics performance of a new or modified CAD design in a virtual way. It gives you new insights and ideas for further development and optimization. This way you avoid an expensive and frustrating trial & error process, manage risks and achieve better results. CFD is also very useful to examine existing products, systems and buildings to determine if there is room for improvement, and if so, to determine which modification is most efficient. CFD simulations are used in a wide range of industries. 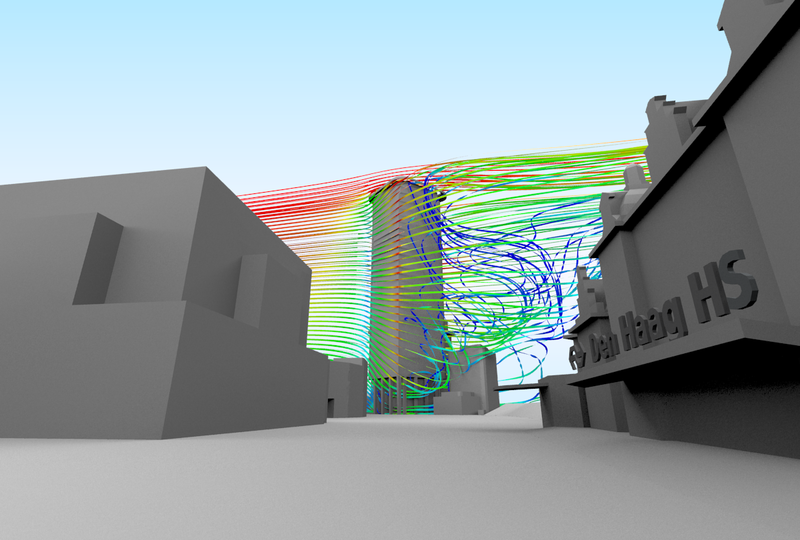 The built environment uses CFD to assess the effects of a building on the local wind climate, to design the most energy efficient indoor climate systems and to predict the smoke and heat development in case of a fire. There are many other industries with flow related products that use CFD during the design process. The field of application is varied, imagine respiratory equipment or blood heating equipment in the medical field; industrial equipment including pumps, fans, mixers and combustion systems; or the aerodynamic design of airplanes, cars, busses and trucks. The starting point of a CFD simulation is a CAD drawing of the product or building at hand. We then prepare this CAD model for CFD, which means we remove all irrelevant details, and create a closed flow volume. Next, we define a computational domain. This domain is the volume in which we calculate the gas or fluid flow. In the computational domain, we build a mesh consisting out of millions of volume cells. The resolution of the mesh should be high close to surfaces in the model and in places where we expect high gradients in the flow field. For every cell in the mesh, the software will be solving the flow equations. In order to run a simulation, we need to make a choice between several flow solvers, each of them suitable to solve a specific physical problem. After selecting the right solver, we select the numerical model and we insert all boundary conditions into the software. When all the input is there, the computer (or a large cluster of computers) starts running the simulation, which typically takes a few days. 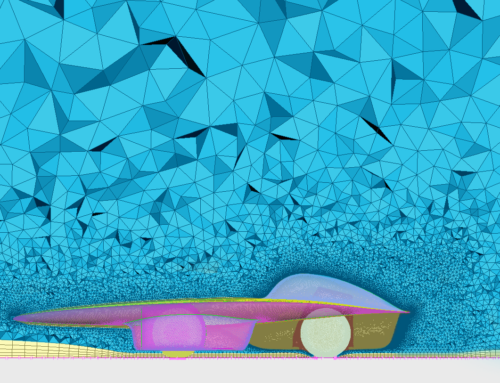 The result of a CFD simulation is a large dataset of information about flow velocities, pressures, and sometimes temperatures in every cell of the mesh. We process all this information into visualizations and graphs that show the performance of a product or building. Based on these simulation results, we indicate potential problems and we suggest solutions. Together with our customer, we discuss which solutions are practically feasible, and which follow-up simulations will be performed to validate these solutions. Step by step, we finally reach a solution that meets all requirements and norms, and that is acceptable to all stakeholders.